“This kind of sentence – ‘Who am I?’ is quite popular. We immediately give our name and qualifications and believe that we have mentioned everything. We hardly have gone deeper to understand our awareness, our own sense of ‘I.’ External things we know – I know my surname, I know my place of sty and all that. But the deeper understanding of life, the purpose and meaning, the direction and the ultimate satisfaction, this we hardly know and we never try to know the end because we are very busy with other things. This is a very sad thing. This reminds me of a story that came in a New York paper. A small man wanted to open an account in a bank. He went to the best bank in New York city. He got in. Instead of the gateman saluting him, he saluted the gateman. He asked to see the manager. They thought he was putting in millions in the bank so they took him there. In the presence of the manager, he was very nervous. The manager was kind enough and asked, ‘What do you want?’ The man said, ‘I have opened an account and want to withdraw money.’ The manager was surprised. He said, ‘If you have opened an account, you can withdraw it.’ The man went out quite dazed and confused and finally walked out of the bank. He did not know why he got in, why he got out. It is just a rough story of why we come into life, we grow up, become old enough, meddle with things, compete with some people. Till then, we are confused. We have not got any grip over life and its meaning, about ourself, our purpose and we carry on. It is a very sad thing. Actually in this world, the things that happen are meant for us to understand and enjoy. But we hardly come to that stage. We are all the time pushed about and are frightened and running here and there and we never understand and enjoy life as it is. You see, in yoga, we try to quieten our mind, clear our heads and see life as it is and accordingly plan to live. There are already people who follow such procedures and they lead a life suiting their situations and accustom themselves to that and enjoy it and there are people who have millions and are wanting to make more millions and are talking about taxation, etc. and are running around confused and frightened. That also happens. “The word Swadhyaya is very important because our self development is dependant on it. We read and hear good things but that is only passive learning. We don’t even remember 10% of what we come across. We should remember good things but should apply it to our life. Sit for some time and analyse how you can apply what you have learnt to your life. Go into the details like ‘when’ and ‘how’. Self effort is required. Swadhyaya comes in Niyamas – it is something that is done regularly. After applying it, when you experience, that is when learning takes place. Otherwise life is meaningless. The Demons looked and were happy with what they saw. They thought the Truth is ‘me’, ‘myself.’ Whereas the Devas looked at the body and thought, ‘Is that everything? The body is changeful. The body cannot be the Truth. So they went back to God. He said, go deeper. They did and found that, ‘I am not the body, mind or possessions.’ They reached the level of consciousness and then of universal consciousness. They did Swadhyaya. Intelligence is also a limitation. After reaching a certain level, you should stop using even your intellect. Be quiet and peaceful – Citta Vritti Nirodha. So the first step is to think of the purpose behind all the things we do. Watch yourself, look within, analyse yourself. We have to form a habit of looking within ourselves again and again as opposed to looking at others or outside us. Thinking is needed, but not about others – Why did he do this or say that? It should be about ourselves. Swa means Self and Adhyaya means Study. Build a relationship with your self. We don’t know ourselves. We react to others, we don’t even live to the fullest. So think about it. Q. What should be the purpose of our life? 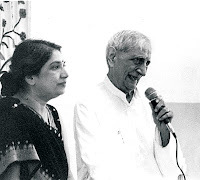 A. Dr. Jayadeva – You think of yours, I’ll think of mine. Smt. Hansaji – It is our habit to ask and simply find the answer. That is not how learning works. Find out for yourself. Every one has to work on themselves. Q. I am not able to concentrate. What to do? A. Dr. Jayadeva – If from the beginning you are not able to direct the mind, start again. Whatever work you do, put your mind to it. If you can tell what you ate today, it will be beneficial. We eat but don’t think about it. That’s the mistake. Smt. Hansaji – This is a matter of habit. There is a practice in yoga called ‘Reflection’ where you recall the whole day’s activities. If you can’t remember something, it means you are not doing it with concentration. We only remember things when we take interest in something and analyse it and think of it again and again. Put in effort. Q. Why do different people have different views and difference of opinion? A. Dr. Jayadeva – Because they are different people. Each one will have different thinking. How can you expect that the person’s opinion will be understood by you? You can’t understand. It will be unique. Smt. Hansaji – And because of this, it becomes your responsibility to know yourself more. Everyone’s level, thinking and methods are different. Q. I do not get good sleep. What to do? A. Dr. Jayadeva – If this is since a long time, get it treated. A psychologist can provide the treatment. But if it is since few days, then we can do some work ourselves. Do not speak before sleep or talk of things which will increase thoughts. Do few Asanas, remember good things. With this, sleep can come. Smt. Hansaji – Sleep is a very natural phenomenon. If you are not getting sleep, there is some basic problem that we have to find out. Anyway, if you sleep for 2-3 hours, don’t worry. Rest of the time, do some yoga techniques. If it does not work, take psychiatric medication first, start getting sleep and then slowly start working on it. Q. How to take the first step for Swadhyaya on ourselves? A. Dr. Jayadeva – Keep a diary and write on what you did. Smt. Hansaji – Yes, write on what you did during the day, when you got angry, etc. But don’t write of others. Q. Rising inflation is becoming a big threat to a person’s satisfactory life. What is your opinion? A. Dr. Jayadeva – Well, you have spoken this, everyone has heard. If they have heard you, they will give you some money. Smt. Hansaji – Stop this kind of thinking that there is inflation and things are getting expensive. Keep some faith that in this big world even an ant and even an elephant finds some food from somewhere. If there is a problem, the solution will also come. Thinking will not help.